The motive behind this post is to express the solidarity to the people all over the world who lost their jobs/income source cause of the reckless recession. Around 30 lakhs of jobs have already been lost all over the world as an offshoot of this so called shocking recession. It is a figure which is accumulated only with the revealed data. A majority of these people and their dependents (about 90 lakhs - a raw calculation) will be in a great mess. The biggest issue is, they have to change their entire routines. Will these people maintain the society as usual? People who are comes in a salaried class may well aware about the chaos of the above category. Searching and finding another job is also became tough as the majority of employers are not in a mood to accept you even if you are the best in your class. How far it long, the duration of such a toughest time is also not yet been assessed. Then ? 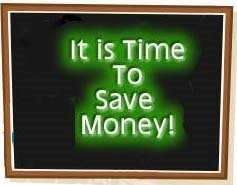 Some of the following tips may reduce your expenses as well as to save the valuable energy stuff. Hope that the points may also help you to reduce the impact of recession on you. You may think silly on some of the tips below, but hope most of these are worthy enough to adopt. If you can implement even a few of these changes into your habits, you'll be on your way to saving money and improving your financial stance. Adopt yourself along the way to encourage further money-saving practices. Expect comments and request to share your experience in cutting expenses in your own way. My wife Mrs Saritha contributed in a great way to present this article. 1. Ensure that the water pipes are not leaking and tight the faucet to ensure there is no chance of a drop again. Water is precious for all of us and reducing water bill is auspicious for you now. 3. Try to wash and Iron the cloths bulk in-house instead of out. If you can’t wash, at least try to iron yourself. Its simple and an exercise too. Stop buying clothes that are “dry clean only.” Learn to iron. Only do full loads of laundry and fill the machine before running it. 4. Assure that your vehicle tyres have enough air pressure to achieve maximum mileage. Never let your car engine idle; it burns more Gas/Petrol/Diesel than turning off the engine and then re-starting it when you're ready to go. 5. Cable TV, direct TV and dish network (all the entertainment stuff) bill reduce as much you can. 6. Re-fix your Mobilel phone plan. Most of the job losers were sumptuous on company sponsored data plan till the time. Go for the least expensive plan that meets your needs. 7. Rethink on your internet using hours and change to the best economy plan which suits you. 8. Moving to a shared house may cut down your expenses if you are single living in a rented apartment. Get an appropriate roommate and share the expenses whatever or wherever you both can. 9. There is none an ignominy in bargaining to any of the seller. He did it earlier and that’s why he is still sitting there. 11. Buy a fuel efficient used car if it necessary instead of buying a new one. 12. Wear clothes a couple of times!.. before washing to save money on energy and water usage, as well as detergent. (not more than that! ). 13. Can you stop certain subscriptions of Magazines and newspapers? Much of the same information can be find on the Internet. Decide yourself which is better. 14. Cut short your alcohol consumption. Experts say alcohol is not good. Its expensive. If you can’t stay with out it…use water instead of soda, It's better for you and is much less expensive. The best is try to stop yourself or reduce gradually. If alcohol is in your blood, you will spend more than usual, Gauge yourself. 15. Do the purchase in bulks which reduce the price. 16. Find your nearest library or try in internet than purchasing books and magazines. You will get much more from there. 17. If you have both the Land line and cell phone? Maybe it’s time to cut the costlier one. 18. Take the bus instead of driving and calculate the saving after a month. Is it a considerable saving? 19. Keep only one car for the entire family. 20. Take some water in a tumbler to rinse the mouth instead of running water till you finish brushing, or keep the faucet off until finish a cycle of rinse. 21. While cooking use pressure cooker and its separators. This will enable us to cook couple of things together quickly. 22. Avoid channels and ads on TV which drain your pocket. You and family won’t see all the ads and be as tempted to buy. 23. Make energy-efficient changes at your home, like unplugging idle appliances and replace the entire conventional light bulbs with CFLs. This may considerably reduce your electric bill. 24. Assure twice that the switches are off when you left the room. Remove or disconnect the power indicators as well which are working through out the day only to show their presence. 25. Sometimes go for the free stuffs too, If you never tried this before. Take 2 and get one free is better in some cases. 26. Stop the subscriptions of stuffs which you maintain for the purpose of conceit. Don’t renew subscriptions of publications you don’t have time to read. 27. Let your hair go gray. You will be treated as an experienced one. 30. Don’t get divorced now or at least wait until the recession ends, both of you will in great benefit. 31. Scrutinize the allocation charges and entry/exit loads before investing in ULIPs/Mutual funds. 32. If you are invests in stocks, select the platform which have less brokerages. Do your on study before investing in any of the stocks. 33. Quit/reduce smoking, if you are a regular. 34. Reschedule buying gifts to the next occasion. The hosts know that you are jobless. 35. Talk to your family and children about the recession and how it affected your family. 36. Involve your children in reducing expenses by teaching them. 37. Encourage other members to contribute for household expenses. 38. Search for multiple part time jobs that can manage by you or family members. 39. Adopt healthy cooking practices to save cooking gas. 40. Keeping fast once in a week is better for your health and it will give some rest to the internal machinery. 41. Cook once in a day, and reduce the number of dishes to minimum. 42. Control your purchase habits strictly in all respects. 43. Choose vegetarian dishes when you’re out, lesser cost and better for health. 44. Ask your family members to limit the time under shower. 45. Adopt intentional changes to good driving habits for the best mileage. Drive slowly and don't make sudden changes in speed. You'll get better mileage. 46. Walk, Walk, Walk or do your exercises at home itself. You can cut the gym/aerobics/health club membership. 47. Buy only which are necessary and in your must-have list. Don't buy something only because it's cheaper. 48. Try vacations at home. Try to do things you’ve always wanted to do with in home and save on the excursion costs. 49. Avoid using credit cards if possible. Or try to pay off it monthly and avoid paying interest. 50. Prepare yourself first before doing all the above.